> Our Heart “Beets” For You! Our Heart “Beets” For You! Healthy beetroot is the key to a healthy heart beat! Firstly, I must apologise for the pun, but it is Valentine’s week and I could not help it. Beetroot is on my mind this week as I always try to pop it into my smoothies. I quite enjoy the taste, it’s rich and almost like a berry. The colour is divine, too, who doesn’t want to drink such a super looking smoothie? Make sure you do not make my rookie mistake though, and use the pickled beetroot you often find in the salad aisle. Not recommended! Did you know beetroot is traditionally used to treat a range of ailments? If you suffer from skin problems, constipation or fevers – you might try some beetroot as a cure. Beetroot is a good source of iron and folate, a naturally occurring folic acid. It also contains magnesium and other antioxidants. Importantly it contains nitrates and the content it holds is thought to help lower blood pressure. 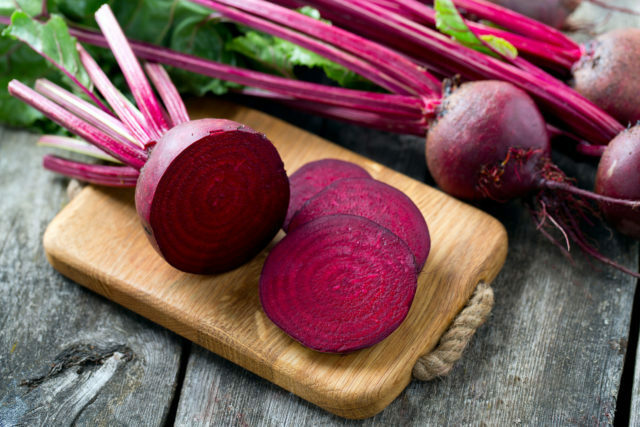 If you or someone you know suffers from high blood pressure, it might be worth adding beetroot or beetroot juice to your diet. Beets in a cake? Yes, really! OK, I admit this is the last thing I would have thought to do with beetroot, but my curiosity piqued when I kept coming across recipes for beetroot cake on Pinterest. If you think about it, it’s a great way to get some healthy goodness into your system under the guise of a treat. 1. Preheat oven to gas mark 5/190°C /170°C fan/375°F. 2. Beat together the Flora Cuisine, sugar, eggs and vanilla extract until mixture is smooth; about half a minute in the food processor should do it. 3. Add melted chocolate and mix together thoroughly. 4. Sieve the plain and self-raising flour, drinking chocolate, and baking powder together into a large mixing bowl. 5. Make a well in the centre, add in runny chocolate mixture and fold the mixture together. Fold in the finely chopped beetroot. 6. Divide the mixture among two greased, lined 18cm (7 inch) prepared cake tins. Bake in the oven for 30–40 minutes until cooked through. 7. Cool on wire rack and remove greaseproof paper from the base of each cake. 8. Sandwich the two cakes together. If necessary, level the top of one cake off slicing off any prominent risen peak. Spread the newly levelled top with a nice thick layer of jam. Turn the other cake upside-down and spread the whipped cream evenly over the base before turning it the right way up again and putting it on top of the jam-covered layer. 9. To make the ganache, place the cream in a saucepan and bring to the boil, stirring continuously. Add the chocolate and stir until the chocolate is melted and the mixture combined. Pour into a bowl and whisk until fluffy and cool. Spread the ganache smoothly and evenly over the top of the cake. We hope you enjoy this cake, maybe put your feet up with a cuppa and the latest issue of The People’s Friend Special.